Welcome to episode 011 of Library Figures. In each episode, we interview a new guest and hear about one of their favorite marketing strategies. In this episode, Trey Gordner of Koios will be sharing about how his company helps libraries qualify for Google Ad Grants and optimize their adwords. He talks about how to choose good keywords, direct traffic to your website, and keep your landing pages relevant. Trey also talks about how to track the right data to be sure you are getting the results you want. Don’t worry we won’t sell your information or give it to any third parties. Brought to you by Piola, the very first patron inspired digital library branch. I’m your host, Tyler Byrd, and this is Library Figures. It’s a show about the people, data, and strategies behind some of the top performing marketing campaigns in the library industry and how they’re driving community engagement like we’ve never seen before. [00:00:32] Tyler Byrd: Alright, Trey, welcome to Library Figures. I’m really glad that you’re joining us for the show today. I’ve been trying to get you on. You’ve been feeling sick. I’ve been sick. We’ve been back and forth on this for a little while. So, it’s exciting to get you on the show. So, to get us started though, if there is someone out there in the space that’s listening right now that hasn’t met you or hasn’t been to one of your speaking events at any of the library conferences, can you kind of give us an intro to who you are and what you do? Yeah, absolutely. So, thanks for having me, Tyler. Excited to be here. My name is Trey Gordner. As you said, I’m the founder of Koios, a library marketing company. I got started with that about four years ago. I’m from South Carolina originally. So, if you see me at a library conference, I’m probably wearing a bow tie. And my wife and I live outside of Washington DC. [00:01:18] Tyler Byrd: So, this episode is a little bit different. Because up to this point, we’ve had pretty much only librarians on the show, talking about what they do for marketing internally. And so what I’m really excited about is that you’re outside of the space. You definitely work in the industry, but you’re going to bring a little bit of a different approach and thought process. And so as far as that goes, this will be a really interesting episode. I think we’re going to get a lot of value from it today. Give us an update. What is it that we’re going to be touching on today? What are we talking about? Yeah, so I mentioned Koios is a library marketing company. Specifically we help libraries show up first in local Google search results for everything they offer. So, the idea is that when someone in your community searches “job openings near me,” we want your career center library to show up first. So, we’ll be talking about how we do that and how you could try this for yourself, paid search marketing. Tired of Your Library Website? What if we told you there was cutting-edge alternative, and you wouldn't believe the price? [00:02:15] Tyler Byrd: That’s pretty specific, and I imagine that’s a pretty difficult thing. And so you got to be pretty good at it in order to get that done. Don’t I already show up in Google though? Why should I be concerned with that? Yeah, so the key point we make is everything you offer. You probably show up already when people type your library’s name specifically, library hours, or public library near me. But the big question is what about reasons to use your library. What about “learn Spanish” or “computer classes?” That’s where we want to ensure your library shows up first. Imagine if Amazon only showed up when you typed ‘Amazon’ into Google. That would be a problem. Yeah. Yeah, they wouldn’t be nearly as big as they are today, right. Yeah, taking over the world it feels like. Alright. Well, how do you do that? Is that just hanging out and putting as many key words for the topic on the page as possible and just…? Is that how I do it, or what’s the process there? Yeah, so there’s two ways to show up in Google search results. One is organic search. Those are the ten blue links that you’re probably used to if you use Google. And then there’s also paid search. So, organic search works off of the Google organic algorithm, and you need to do SEO, search engine optimization, to make that work. And that’s usually a pretty big investment and takes a long time. Whereas paid search marketing, also known as search ads, you’ll show up near the top. It’s usually less expensive up front. You can get started right away. And like you say, you can target some specific keywords from the start that you want to show up for. Yeah. So, what is it that you all do specifically? Is it the organic side, or are you working on the paid side? We work on the paid side. And specifically we help libraries qualify for a program called Google Ad Grants. That’s a program that Google has been running since 2004. It allows nonprofits and public libraries to get up to $10,000 a month in advertising credit for free. And practically speaking, that’s more than most libraries or nonprofits will spend in budget. So, when you work with Koios, you’re only paying for the management. Whereas someone like Amazon, when they’re buying ads, they’re paying for someone to manage it and actually paying per click for that real estate. Okay. So, this is pretty cool. It’s definitely not something I personally have ever run into when it comes to the private sector marketing. It’s very unique. 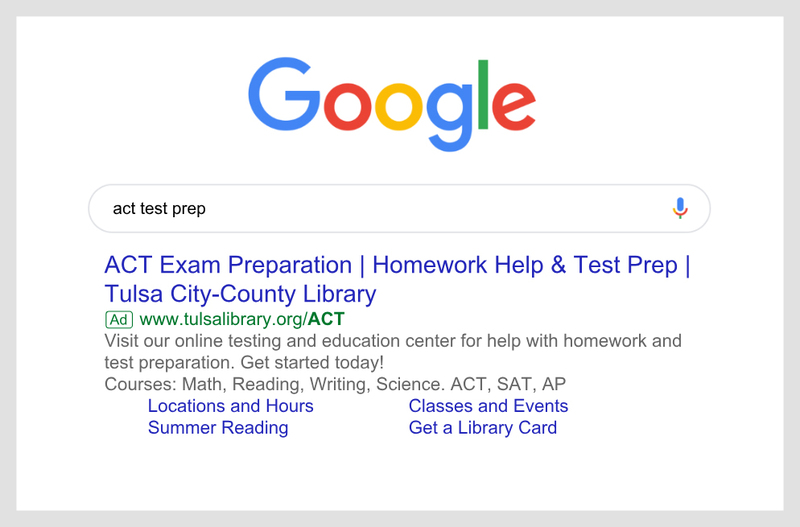 You can get a library signed up for this program where they’re going to get $10,000 a month free to spend on Google AdWords. Is that right? And then you guys can manage the process as far as getting the AdWords, and getting them optimized, and getting them to search or rank there at the top, the results for those different pages using that 10,000. Does that 10,000 expire? What’s the deal with that? Is that a one-time a month? Is that for a year or a quarter? Or what happens there? Yeah, so officially, it’s metered at $329 a day. So, you can think of it as kind of expiring every day. You spend $329, or you don’t. But the next day, it renews. Google fills up that cup again. This is a program, like I said, that Google has been running since 2004. They recently announced a renewed commitment to the program. They started putting more staff resources into training and customer service, but also working with agencies like us to create a really great experience for nonprofits around the world. Okay. And so this is a program that any library could sign up for. Have you had a library apply that hasn’t been accepted? Occasionally, that will happen. It’s usually an issue with their set up. So, the way that the application works – first, you enroll with TechSoup. A lot of libraries already have a TechSoup account. Then you’ll use that Tech Soup account to start a Google for Nonprofits account. And then this is where there usually ends up being some trouble. 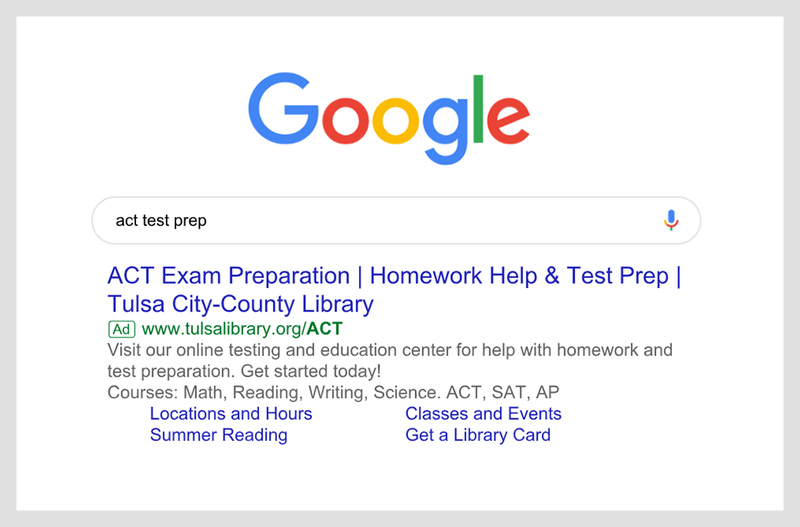 So, if you’re listening, and you’ve been denied for Google Ad Grants, most likely it’s tactical issue with the way that you set up or submitted your Google Ads account for enrollment in the program. So, we offer free help with the application process. You can go to our website and contact us for that if you need any help. But yeah, once we work with libraries on that, no one has ever been turned down. Nice. So, just to be clear, they don’t actually have to go through you or hire your agency. They could apply as a library on their own. And it sounds like you’d even be willing to help them out through that process. So, this is an open Google program for everyone it sounds like. Yeah, that’s absolutely right. We don’t have any monopoly over this program. We are just trying to create the easiest opportunity for libraries to take advantage, hit the ground running, and to use that budget wisely for their priorities. Nice. I love it. I love it. That’s great. So, here’s what I know. We’ve done a lot of AdWords in the past for private sector stuff. And what I see is a click might cost me $150 per click. So, $300 give or take for a daily budget, that could go in two or three clicks if you’re not doing it right. Especially if you haven’t taken the time to optimize for it. So, tell me this, getting in there and doing it right and getting these ads set up so they work and that you’re not spending all your money on one or two clicks, do you have some best practices that a library could follow or implement to kind of get started? Yeah, absolutely. So, to your point, the way that this is actually calculated is a cost per click. So, some key words are very expensive, and some key words aren’t very expensive. In many cases, the key words that libraries are using are not very expensive. Things like learn Spanish, for instance. There aren’t that many competitors in your geographic area that are bidding on learn Spanish, especially if you say “learn Spanish for free,” or “free e-books,” or, “free audio books,” or something like that. And so in order to spend that money wisely and to get the most out of it, you want to find those not as competitive opportunities where your cost per clicks are two dollars or less. Yeah, that actually seems like a really good strategy. So, if you’re picking them up at two dollars or less because you’ve picked the low hanging key words…fruit…that aren’t competitive, you’re getting them back to the site, and you’re really still introducing them to everything else the library has to offer at that point without using all your budget up on a couple. So, I like that. What are you doing when it comes to get them back to the page? Are you sending them kind of to the home page then? Let’s take your example of a Spanish class and learning Spanish. Do you just send them back to the library’s home page? Or do you do something else with that? Yeah, that’s a great question. So, ideally we’re looking for landing pages that are specific to the resource. So, our best case scenario for learn Spanish is a page that’s dedicated to Spanish conversation classes or Mango Languages. And it’s the library’s website /mangolanguages. It has one paragraph that explains the resource and one big button that says “get started.” It should also load pretty quickly and be mobile friendly. That’s the ideal. So, in that ideal scenario, is it specific to just that? So, are you saying don’t add anything else, don’t put your kids’ painting event on there, or an art event, or something that’s not relevant? It really is just that one topic? Yeah. You have to remember that if people are coming through a search campaign, they have typed something very specific into Google and seen something very specific in the ad. And so it’s important to keep that relevance all the way through the experience. That’s how you’re going to ensure that people take an action at the end and also that you get a great quality score from Google, which is part of the Google Ads decision. So, imagine someone types in “learn Spanish.” They see an ad that says, “Learn Spanish for free at the library.” “Wow. Great. I didn’t know I could do that.” They click on that ad, and they’re directed to your A-to-Z database’s page, for instance. They’re probably not going to make it through to actually use the resource. And so that good landing page for the one resource ensures that people are connected with what they need at the library. And that’s ultimately a great user experience and helps them access what they need. So, if that page is set up right, and it’s using similar keywords to what you have in the ad, do you see that your cost per click goes down, or does it stay the same? Or does it have an impact on that pricing? It does. We use …without getting too much into the technical details… You can tell Google to optimize and kind of put it on autopilot a little bit to find keywords that are going to convert. So, converting is just a fancy way to say actually go onto use the resource. So, if you have a big button, and you tie that into your Google Analytics, for instance, you can tie that bag into Google Ads so that you bid more when people are more likely to click the button and start using. And you spend less when people might just be generally curious. Is there anything that you do as far as timing goes? Do you look at your currently daily schedule as far as what the time zone is and when people are most likely to search so that the ads appear during times when people are up and looking versus the middle of the night when maybe it’s going to be foreign traffic that’s not relevant? Yeah, so the main way that we target is geolocation. 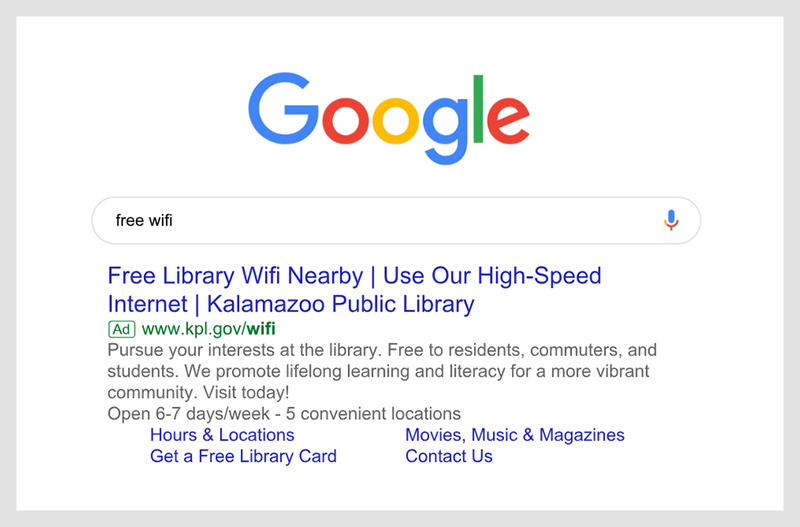 Google Ads, one of the advantages of paid search marketing over libraries investing heavily in SEO for instance is that SEO can overlap very quickly beyond your service area. So, if your SEO is really strong for computer classes near me, let’s say, you might be getting traffic from people who are two counties over and can’t really use that resource at all. Whereas with Google ads and paid search, you can define your county or your service areas based on zip codes as a shape. And only people within that shape will see your advertisements. So, that’s the most important thing you can do – targeting wise – for a paid search campaign – target it to your service area. Beyond that, yes, we tend to see… We don’t necessarily limit our campaigns by time or by day. Though you certainly could. But we do see some clear trends. So, searches that might trigger our Lynda campaigns, for instance, information about using Excel or learning a coding language or something like that may happen during the day when people are at work and are trying to get help with some professional task. And we see more demand for entertainment related searches like watching movies or getting audio books at night when people are at home and looking to relax. Oh, that’s interesting. That actually makes a lot of sense. I could see how that user behavior would change through the day and why that would be the case. Now, when you’re implementing these ads, and you’re managing that, is there a software that you’re using? Or is it just kind of the default Google AdWords interface that you log into? Anything I’m describing, you can set up in the regular online Google ads interface. We use Google AdWords Editor, which is an advanced tool that you can download to your desktop and make some more advanced changes that way. It tends to work much more quickly. But the main tools of our trade are Google Analytics, Google Tag Manager, and Google Data Studio. So, we connect Analytics to ads, so we can see our percentage of new users for instance through the campaigns so that we’re not just getting people who already have a library card and are faithful users already, but we want to confirm that we’re reaching people who have never been to the library website before. Working with Google Analytics allows us to get that kind of information. Google Tag Manager is a tool that extends Analytics and allows you to track meaningful actions on your website. So, for instance, if someone signs up for a library card, we click, count that, and attribute it to our campaigns through Google Tag Manager. Similarly, placing a hold, or RSVP’ing to an event, or passing through and signing up for a database. All of those, we count through Google Tag Manager and report through Google Data Studio, which is how we show a dashboard of web analytics and marketing analytics to our clients. Nice. You’re getting into my favorite part of these podcasts, the data. If we’re going to talk about that a little bit… You’ve given us a couple of areas and things that you’re tracking. Is there something that you find that is a really great metric that you want to drive patrons towards or that you use more often than not as far as a metric or a KPI goes? Yeah, absolutely. So, at the end of the day, for us it’s all about conversions. And conversions are these meaningful actions on the website. So, the holds placed, the databases used, the events signed up for, the library cards issued. All of those we consider conversions. And those are what we report back to the libraries and how we really evaluate our success. If conversions are high and if the conversion rate is high, then we know that we are driving quality traffic to quality pages for quality results. Other metrics that are important, clicks and your click through rate. So, making sure that your ad is relevant. If your click through rate isn’t high, that’s a good sign that your ad isn’t very relevant to what people are searching for. And then impressions is just making sure that your campaigns are set up in such a way that Google considers them high quality and is showing them on a regular basis. So, an impression is a view in Google search results. This is great. You’re speaking my language right now. I love it. Hey, all. I wanted to take a quick second and tell you about a project I’m really excited to launch this month. It’s called Piola. Piola is a digital library branch, and it’s replacing library websites. No longer is a library website just a marketing communications portal. It really is a digital library branch where patrons are coming to find the best experience possible and really learn everything that your library has to offer, and access all of that fantastic content and a user experience just like what they’d get from a traditional branch. We’ve taken thousands of hours of research, including heat mapping, user surveys, video recordings, patron focus groups, A/B testing and conversion rate optimization, content audits, and a whole lot more in order to figure out what patrons really want and expect from their public library website. We’ve rolled all of that into the best most affordable website product possible. You can launch it in less than 30 days. And you’re not going to find anything else like it on the market today. If you’re interested because you’re struggling with your library website today, and you might want something a little bit different, I encourage you. Head on over to meetpiola.com and check it out. We look forward to seeing you there. Thanks. So, when you’re looking at that, are you tying a specific metric to a specific campaign? So, if you’re sending someone… Let’s go back to that example of the Spanish class or learning another language. Let’s say I have my AdWords set up. I’m sending them to this landing page. What would you be tracking when it comes to a metric for that campaign? And is it the same as all the other campaigns? Yeah, so to use the learn Spanish example… And I’ll mention…throw out Mango Languages again. We love working with those guys. Know them well from our conferences. So, if we take the example of learn Spanish and Mango Languages, someone sees the ad in their results. That’s an impression, which is tracked against that campaign. If they click on it, that click is counted, tracked against that campaign. And then on the landing page, what we prefer is Mango Languages, learn 72 languages for free, top rated app, and online web app. Something like that with a nice picture and then a big button that says “get started with Mango Languages.” That big button, “get started with Mango Languages,” it what we’re tracking as a conversion in that case. And we’ll also track if there’s a “get a library card” button, which we strongly encourage. Because we don’t know if these people have a library card. If they’re coming straight in from Google search results, we’ll track that as well. So, those are our conversions. Yeah. I love that. I really like the idea of having that second button there as well. That makes just a ton of sense. It shows that you’re being really intentional about thinking through how the patron is going to use that experience and the process that they will go through as well, which I think is really key. Within that, are there some common mistakes that people might make either in setting up the ads, or setting up tracking, or maybe even tracking the wrong metrics? Some common mistakes… One I alluded to before. It’s going after overly competitive searches. So, an example of…a couple of examples of competitive searches that libraries might try to get involved in and be initially disappointed with the results – meeting rooms and meeting rentals. Hotels in your area tend to be bidding on those and bidding quite a lot of money. Because if a hotel gets use of a meeting room, becomes a venue, then that might be a couple thousand dollars and a contract. And so they’re bidding quite a lot of money on those results. So, if you’re using an Ad Grants account for just general meeting room terms, you might not see very much at first. So, going into those overly competitive markets, that. Another example might be financial planning. Banks bid a lot of money on terms around investments, for instance. So, if you have Morning Star, and you want to promote that you have investment help, that can be a competitive area. Whereas these examples I gave before of books, or e-books, or audio books. Those tend to be very easy to see results very quickly. So, that’s one common mistake I see. And then another is match types. So, if you’re really trying to get started in Google ads, an easy mistake to make is setting up the wrong match types. Google has three different kinds of matches. One where you put in a keyword. Maybe you say “learn Spanish” again. We’ll use this example. If you put in “learn Spanish” as a broad match, then that will show up for anything Google thinks is related to learning Spanish. So, including maybe translate Spanish, for instance. But a phrase match or an exact match, a more specific match type, will only get you those searches for “learn Spanish,” “learn Spanish free,” “learn Spanish online.” And so you want to be careful with your match types because you can very easily spend your budget in the wrong places or on people who aren’t as interested in converting. I like that. So, this is why I was really excited about this episode and having you come on outside while still in this space and the industry but outside of being in an actual library. At the end of the day, you focus on this. And so you’ve spent so much time figuring it out and just optimizing and tweaking it. There’s so much value to someone that has that specialty and that hyper focus. It’s just phenomenal. But this wasn’t meant to be a sales call by any means. But I have to ask you at the same time. If a library can go on and do this themselves, they can apply for the program, AdWords is free, all you mentioned as far as I’m aware are free, why wouldn’t they do it themselves? What’s the benefit of having you and your agency come in and help them with this? Yeah, so it’s absolutely true. Go out, try it on your own. Feel free. As I said, no monopoly over the Ad Grants program. And we just want to encourage as many libraries as possible to sign up and take advantage. But I like to say that Ad Grants is free like social media is free. It’s free to post something on Twitter. But the strategy behind the post, the constant improvement, the preparing the message that you want to say and remaining consistent, not to mention the expertise in the tools themselves, all of that takes a lot of time and effort. A library marketer can do just about anything, but you can’t do everything. And most of the library marketers that we meet, they are responsible for print. They’re responsible for social media. They’re responsible for email. They’re responsible for PR. That’s a lot on their plate already. So, the main point about working with Koios is if you don’t have the capacity to do this right now yourself, it’s better to sign up and hand it off than to let it sit unused. Okay. I like that. And I think that’s a really great benefit and reasoning for that. I’m going to kind of go off script here and step away from the topic real quick. Being from outside of the space… What I want to know is privacy inside of libraries is a really, really big topic. And I know there’s a ton of librarians that are really concerned about how they use patron information, what patron information they use, and just that process of even collecting it online or anything. What are your thoughts on that? What do you say to libraries who are concerned about privacy? Yeah, it’s a great question. So, the first thing I always point out is that everything that comes in through the Google Ad Grants program, through Google ads in general is anonymized and aggregated. So, we don’t see and you don’t see or collect anything more than someone saw it, someone clicked on it, someone signed up for a library card. And these are the same kind of metrics that you would get already from your catalog, your ILS for instance. So, just because Google is on the front of it does not necessarily mean that there is a privacy issue here. But on a… As someone who’s not a library marketer personally…is not a librarian personally, I’d say you want to give people the option of a personalized experience. I jokingly refer to this sometimes as don’t patronize the patron. Elsewhere, people are choosing opting into personalized experiences because it’s better for them. It’s better to receive a targeted message, a targeted email, newsletter, than it is to receive one that has no bearing on what your personal interests are. My home library is Arlington Public Library in Arlington, Virginia. And they do this really well, I think. They have a reading history option, and they use PICA as their ILS. It’s turned off by default. But it’s very clear as an option. You can go in and turn it on. And when you do, there’s a little disclaimer that says, “This information that we collect… If you turn this on, and we start collecting this information, yes, it’s helpful to you to see your reading history. But it also might…it could be subpoenaed in theory under the Patriot Act.” And so the very clearly explain the cost and the benefit. And it’s up to me as the user to make the decision. So, I’m not saying mention the Patriot Act in every single one of your marketing materials. But I am saying elsewhere, everywhere else, patrons get the opportunity to opt into a personalized experience. And we should value the patrons’ choices above our own assumptions about how they feel about privacy. I am so happy I asked that question. I couldn’t agree with you more. Well said. Thank you for that. I know that we’re both on tight schedules today. So, I’m going to jump into kind of our speed round and see…have you answer a couple quick questions for me. So, starting with what’s a book that you haven’t read yet but you would like to? Oh my goodness. Well, I could just point people to Good Reads. There are about a thousand on there, I think, that I would like to read and haven’t gotten to. One that’s sitting beside my bedside waiting for me to start is ‘Antifragile’ by Nassim Taleb. I’ve read a little bit of it, but I’m interested in setting aside some time and digging in. Nice. Okay. Do you prefer print content or digital content? Depends on the content. For shorter form, online articles are simply great. I am a big user of my library’s Lynda.com subscription for technical skills. But when it comes to reading a long form story or a long form argument, nonfiction, print, fiction, audio book. Alright, very good answer. What source or sources do you use to stay up to date on marketing? Google itself has different newsletters – Think With Google, Google Trends, things that I subscribe to. I also am a big fan of the moz SEO blog. Most of what they talk about is specific to SEO. But they have some great advice on web visibility in general for anyone interested in that subject. Perfect. Alright. So, if some of our listeners want to get ahold of you and chat more or take you up on your offer of helping set up the system for the grant, how could they get ahold of you? How do they reach out and find you? Yeah, so you can reach me by email. That’s T-R-E-Y, @koios.co. Or you can go to our website, koios.co, K-O-I-O-S .co. And look for the “contact us” button. Thank you, Trey. I appreciate it. So, one last thing. I haven’t asked anyone else this. But I know you’re speaking all over the place. And coming up here in a couple days, actually maybe when this podcast is released, you’re going to be speaking here in DC. What’s your next couple speaking gigs? If someone wanted to come out and hear you or see one of your in person kind of presentations. Where are you going to be and when? Sure. So, we’re speaking at Computers and Libraries. It’s actually a colleague of mine, Peter Valikanya [Phonetic]. We’ll be talking about his research on what your community wants, looking at Google search data for community development. And then next month, I will be at TLA giving a talk on Google Ad Grants specifically. So, you can find us there. And there will be plenty of opportunities through the summer and the fall, like you say. Library Marketing and Communications, Internet Librarian, and a handful of others. Alright, before we head out, just a couple more quick things. If you know somebody that you think would be a great guest on this podcast, and you’d like to hear us interview them, I’d love the opportunity. Send me their name and their contact information at hello@meetpiola.com. That’s hello@meetpiola.com. And I’ll do the hard work of reaching out and getting them scheduled so that all of our listeners will have the opportunity to learn more from them about the great marketing strategies that they might be using. We’re constantly looking for new guests and great guests on the show, and I would really appreciate the opportunity to meet with your connections and get them up here to learn more. Second, if you’re enjoying the podcast episodes and so far you like what you hear on Library Figures and the content, head over to iTunes. You can subscribe to the podcast to get future episodes. And while you’re there, if you could give us a five-start rating, that’d go a long way in letting us know that you like the content, and you like the show, and we should continue doing it. Alright, until next time, all. I look forward to being on the air again and the next great interview we’ll have up. Take care. We’ll see you next time. You’re all over the place, man. You’re on it. I love it. Thank you. Trey, thanks for joining me and the listeners today and sharing some great advice, and some tips, and helping them in this direction. I think that a lot of people are going to find a lot of value here. So, I really appreciate it. And thank you from me and all of the listeners at the same time. With that, we’ll wrap up today’s show. And as always, we’ll have Trey’s contact information, along with a link to his site and some of the programs that he mentioned in the show notes in case you want to find them. You’ll also be able to find those at meetpiola.com. And yeah, until next time. We look forward to speaking to you then. Take care, everyone.